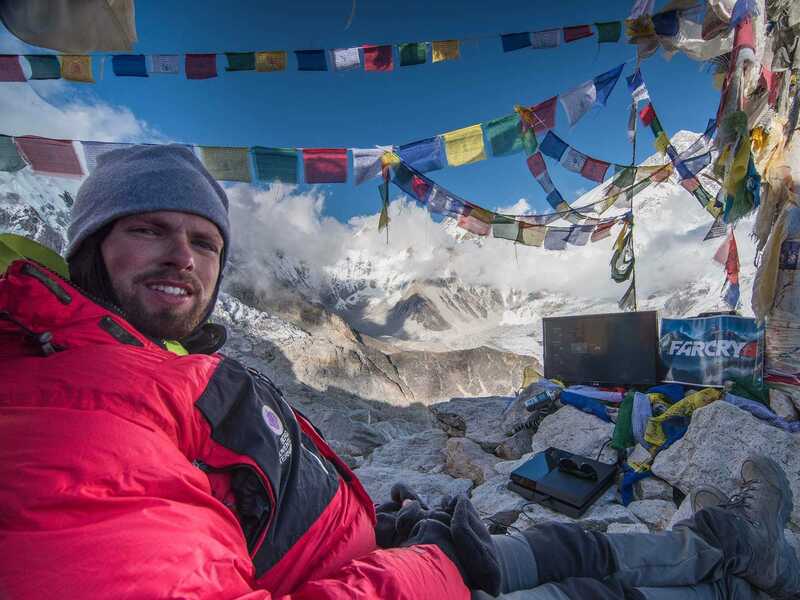 Will Cruz was working at a call center in his home state of Utah when he got the news that he just won Ubisoft’s “Quest for Everest” contest. The contest was to promote the game “Far Cry 4,” which comes out Nov. 18. The contest was announced over the summer. To enter, people had to make 2-minute videos showing why they were the most qualified. “Far Cry” is a first-person shooter that places its players in some wild locations. In “Far Cry 2,” players found themselves in Africa. “Far Cry 3” was set in the wild jungles of an island in the Pacific. “Far Cry 4” takes place in the Himalayas. So it makes sense for the company to promote the game with a trip there. And it doesn’t hurt to get a world record in the process. To earn the record, Cruz had to play the game for more than an hour. And he did that at 18,569 feet, climbing to the summit of Kala Patthar. Yikes. Ubisoft was prepared for the trip, however. They needed to figure out what kind of TV to bring up there so the LCD wouldn’t freeze. They also needed to determine whether it would be OK to take a PlayStation up there that has a CD drive. They didn’t have to worry about that part, though. The build that they used of the game was burned onto the hard drive of the console. UbisoftHe played the game on a PlayStation 4. Cruz also had to leave his wife of two years behind. “She’s a little taken aback about the whole thing, but she’s been a great sport,” Cruz says. 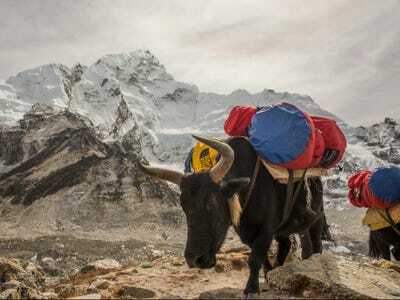 Before climbing in the Himalayas, Cruz had never been outside the country. But he’s no stranger to hiking, often going on some “risky” hikes in his home state, he says. In fact for his submission video for the contest, he climbed the highest peak in Utah. A trip such as this one couldn’t be done alone. He had the help of 15 people, including sherpas and a video crew, as well as the pros at Berg Adventures, to help him on his journey. UbisoftYaks helped carry the equipment to the top. Ubisoft’s Scott Fry said they had extra people onhand to make sure that Cruz was both comfortable and safe throughout his visit. “We had many conversations with Wally Berg, who owns Berg Adventures International, in advance of the contest and the trip, to really go through the logistics of everything that we would need to concern ourselves with, what we would have to have there to make sure Will was comfortable, and that everything would go according to plan,” Fry says. That means they had, for example, extra oxygen and more people forecasting the weather. They also had satellite access, so they could contact Cruz and his team if they needed to. “We really planned everything out long and far in advance and with an expert team of people so that we could ensure everything was as safe as possible,” Fry says. Cruz still had to sign a waiver. And even with a team of experts helping out, the trek up to 18,569 feet was not easy. The group had to deal with the elements, such as high wind gusts that claimed one of their tents. Cruz also had to get acclimated to the high altitudes. “The altitude made it hard to sleep, it made it hard to keep an appetite,” Cruz says. Now that he’s back, Cruz says that he’s going to go back to work and settle back into normal life. But he can’t wait to go back and go on a new adventure. You can check out Cruz’s video diary of his journey on YouTube.